Velox Rugby Club president Steve Neish and West Shore Parks and Recreation Society administrator Linda Barnes stand in front of the playing field the Valhallians will call home starting in 2015. The club is also paying for a turf practice field to be built inside the velodrome infield. Growing the sport of rugby on the West Shore has been something the Velox club has been involved in for some time. 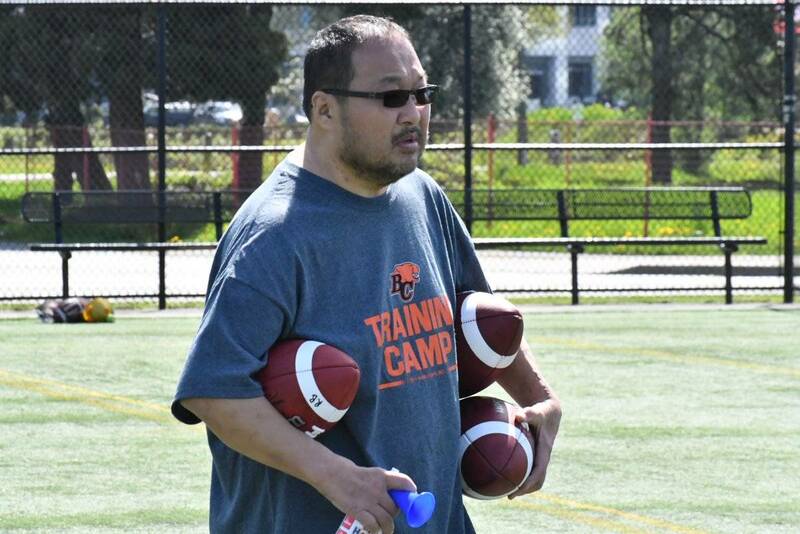 With a number of Valhallians players and coaches living around the area, school programs at Belmont secondary and Dunsmuir middle school and Edward Milne secondary in Sooke, as well as a Langford-based youth program, have seen significant growth in recent years. That relationship between the Gordon Head-based club and its adoptive home grew stronger this week, as the West Shore Parks and Recreation Society announced that Velox is relocating to the Juan de Fuca recreation area for the 2015 season. A major component of the deal, which was roughly four years in the making, is construction of a turf practice field on the infield of the velodrome facility. Velox is covering the $450,000 cost of the field, but it will be used by various community sports groups. The hope is to have it installed by this winter. As part of the benefit, the rugby club will be allowed to erect goalposts and play its Vancouver Island Rugby Union home matches on Field No. 1 opposite the main entrance to The Q Centre. It will also have use of the Kinsmen fieldhouse. “We had a good look around at a number of other options, but we’re pretty happy to be coming out here. Everybody’s pretty excited to be coming out here,” Neish said. With little in the way of capital funds available to the multi-municipal society, the prospect of building a turf field onsite was slim to none, said administrator Linda Barnes. The ability to fit Velox’s league games into the field use schedule only came about after West Shore Parks and Rec signed a deal with the Sooke School District to share fields at Royal Bay secondary once they’re completed next year. Adding an all-weather turf field was the icing on the cake, Barnes said. While the turf will be built inside the velodrome, the project gives the track cyclists more certainty that their facility isn’t going anywhere, Barnes said.